The last group of North Korean athletes has arrived in South Korea to complete preparations for the Winter Olympics Games, set to begin next week in Pyeongchang. Dressed in fur hats and black coats, the 10 members - three alpine skiers, three cross-country skiers, two speed-skaters and a pair of figure skaters - and a large delegation accompanying them - were taken immediately to the athletes' village in the eastern city of Gangneung after their arrival Thursday. They will join 12 female hockey players who arrived last week to join their South Korean counterparts to train as a unified Korean team. The North Koreans flew to Gangneung accompanied by a group of South Korean non-Olympic skiers, who took part in a joint two-day training program at the North's Masikryong ski resort. 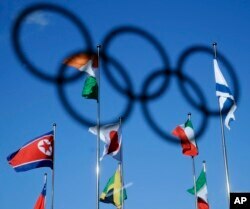 Their arrival coincided with the raising of North Korea's national flag above the Olympic venues in the host city of Pyeongchang and Gangneung, including the athletes' villages, stadiums and practice facilities. South Korea's strict national security law prohibits flying the North Korean flag. The North Korean flag, left, flies among flags from other nations at the Olympic Village at the 2018 Winter Olympics in Gangneung, South Korea, Feb. 1, 2018. The surprise offer by North Korean leader Kim Jong Un to send a delegation to the Pyeongchang Games during his New Year's Day speech paved the way for restored dialogue between Pyongyang and Seoul, which had been frozen due to North Korea's development of its nuclear and ballistic missile weapons programs in defiance of international sanctions. The talks led to an agreement for both sides to march in the February 9 opening ceremonies under a unified flag.